Chinese Spring Festival, also called Lunar New Year, has more than 4,000 years of history. Actually, it is unclear when the exact beginning of the New Year celebration in China is. It was normally said to start from the year end religious ceremony in Shang Dynasty (1766 BC - 1122 BC). A few said that it started from as early as Emperor Yao and Shun (~2300 BC). At the beginning, the date of celebration varies from mid winter to early spring. With the mature of solar base calendar, Emperor Wu (157BC - 87BC) of the Han Dynasty (206BC – 220) established the first day of the first month as the beginning of the year, where it remains. 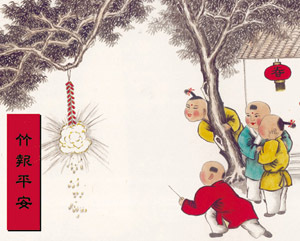 Just like other famous tranditional festivals, there are many legends about the spring festival in Chinese culture. Here is a story which is the most approved: It is said that the custom of Spring Festival started in when people offered sacrifice to ancestors in the last month of the lunar calendar. At that time, people prepared the sacrifice by doing thorough cleaning, having bathes and so on. Later, people began to worship different deities as well on that day. It is the time that almost all the farm works were done and people have free time. The sacrificing time changed according to the farming schedule and was not fixed until Han Dynasty. The customs of worshipping deities and ancestors remains even though the ceremonies are not as grand as before. It is also the time that spring is coming, so people held all kinds of ceremonies to welcome the spring. In the Chinese zodiac, the Snake is listed after the dragon, but its place and its significance as a symbol of worship is far less than that of the Dragon. it carries the meanings of malevolence, cattiness and mystery, as well as acumen, divination and the ability to distinguish herbs. But ancient Chinese wisdom also says a snake in the house is a good omen because it means your family will not starve. This could be taken metaphorically to mean that a Snake could never have a problem with his family starving because he is such a great mediator, making him good at business. All in all, people would prefer to believe that snake symbolizes good luck, good harvest and power. People categorize snakes into domestic snakes and wild snakes. Snake is also the symbol of longevity and power as it can live to 500 years old. Another positive meaning of snake is pursuing love and happiness, embodied in the famous story "The Legend of the White Snake" in which the female incarnation of a white snake fall in love with a man called Xu Xian, gets married with him and is kept in the Leifeng Pagoda in Hangzhou by a monk. Snake has been given many characteristics in China such as mysterious, insightful, and clever. 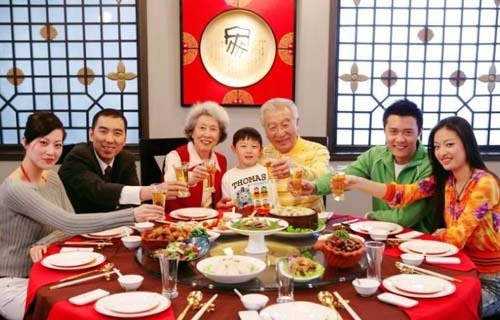 The family reunion dinner, also known as Tuan Nian (tuán nián 团年) or Wei Lu (wéi lú 围炉), marks a family gathering on the Lunar New Year’s Eve. For this meal, the best food and ‘dishes with a meaning’ are served - and in abundance too, as the abundance of food is believed to bring the family great material wealth in the new year. CCTV New Year's Gala is a Chinese New Year special program which produced by China Central Television. 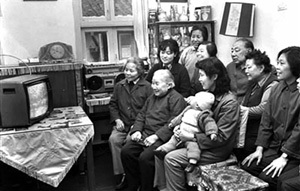 the broadcast has a yearly viewership of over 700 million viewers, making it one of the premiere television events of Mainland China. It's the television show with the largest audience in the world. The show features various acts, such as drama, dance, music, and comedy. Shou Sui means after the New Year's Eve dinner, family member will normally stay awake during the night. Some people just stay until the mid night, after the fireworks. According to tales and legends, there was a mythical beast called the "Year". At the night of New Year's Eve, the "Year" will come out to harm people, animals, and proprieties. Later people found that the "Year" is afraid of red color, fire, and loud sound. Therefore, at the New Year's Eve night, people will launch fireworks, put on some fires, and stay awakes the whole night to fend of the "Year". In Chinese New Year, normal food will be served, dumplings are usually eaten on the eve of Spring Festival. Because its shape resembles the Chinese Yuanbao (a kind of money used in ancient times), eating dumplings means wealth in the coming year. People may also prepare bacon, New Year Cake and Tang Yuan which all signifies family reunion.